Hungry customers stretching their necks out like turtles, eager to be allotted a place. Every small, medium, large table occupied. Hip youngsters larking around pitcher laden tables. Families lunching in quiet. Waiters scurrying with loaded trays. 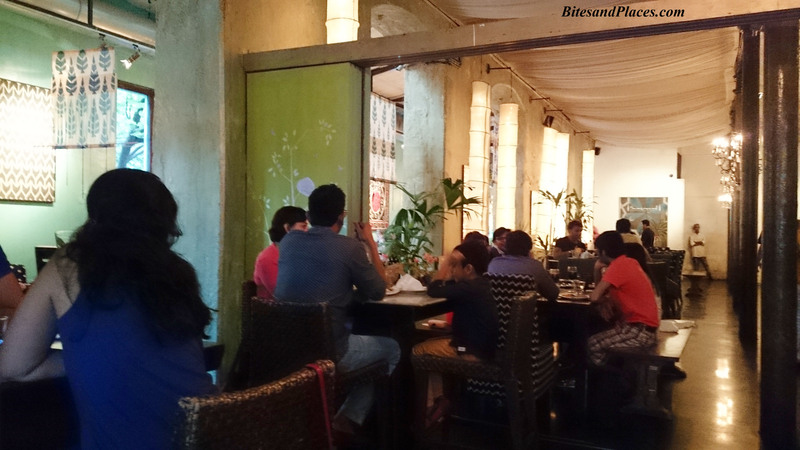 This is a constant racket at The Tasting Room, an upscale restaurant nestled in the famous Raghuvanshi Mills Compound of Lower Parel. 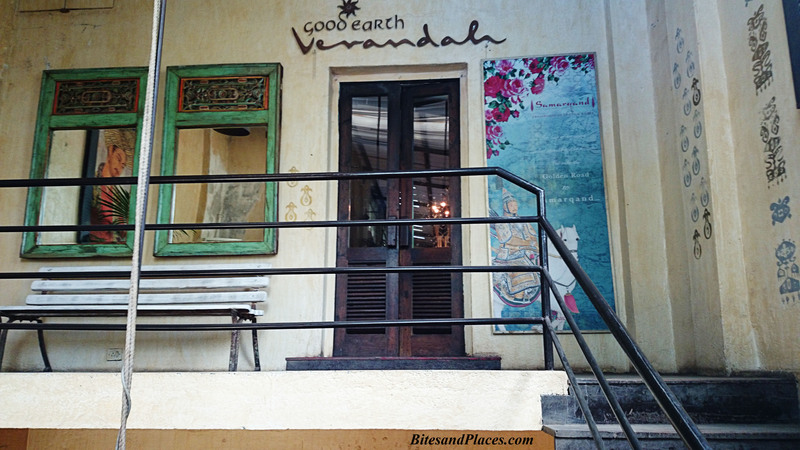 It sits peacefully on the first floor above Good Earth, a place for great interiors shopping. I love the wooden staircase that climbs up to knock the door and let us in. Dont let this humble door fool you. Walk in straight from here and you’ll enter their in-house boutique for some ethnic cotton-wear shopping. Ambience: A chandelier here, a chandelier there and a rustic vibe everywhere. They gleam happily at you; with price tags attached. Wonder if they were for sale. 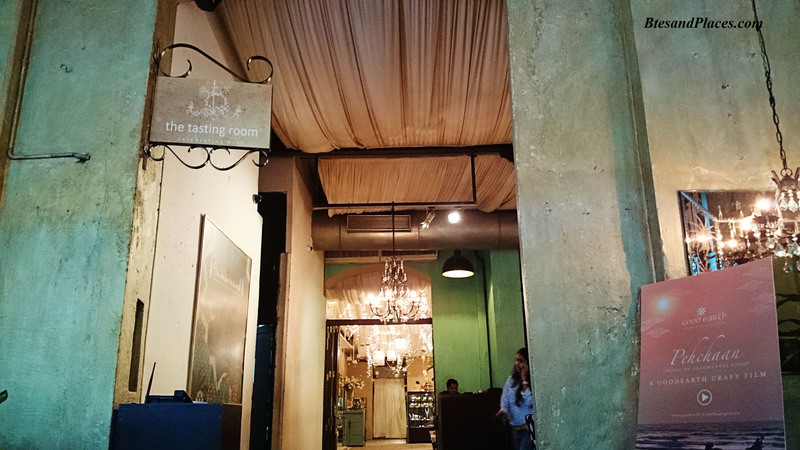 The ambience of an old run down mill has been retained – stoned floors, tall ceilings, et al. Kitschy decor, rustic book shelves, vintage wall murals all add to the beauty. People across ages and nationalities are seen lounging for hours. Seating: With huge floor space inside and in the veranda, you wont have to wait too long. Variety of themes are beautifully incorporated for interiors. Corner couches, wooden benches, bar chairs, wing chairs seamlessly blend into each other. Tables suit all sizes of groups – from couples to a group of 10. Business lunches and dinners are hosted here too. 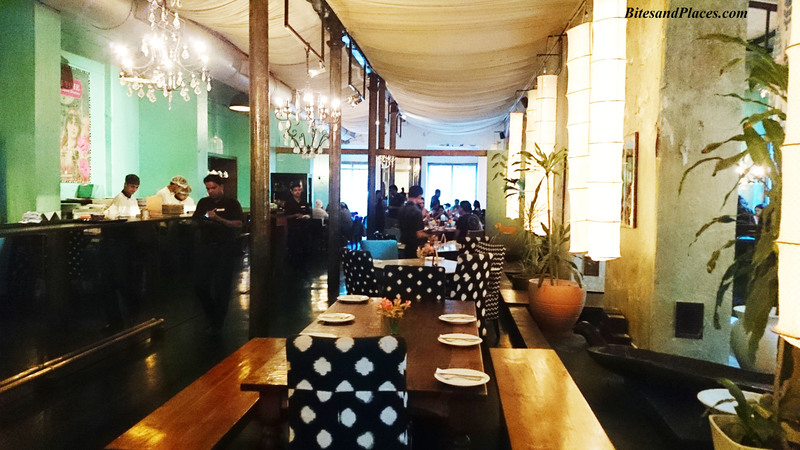 Menu: Beautiful juxtaposition of modern European and exotic Italian cuisines. A smorgasbord of sandwiches and salads, array of coffees, assortment of teas, a bevy of desserts…. you name it and guess, they have it. You’ll have your eyeballs rolling all over. What more, there’s also a Kids Menu for your tiny ones. 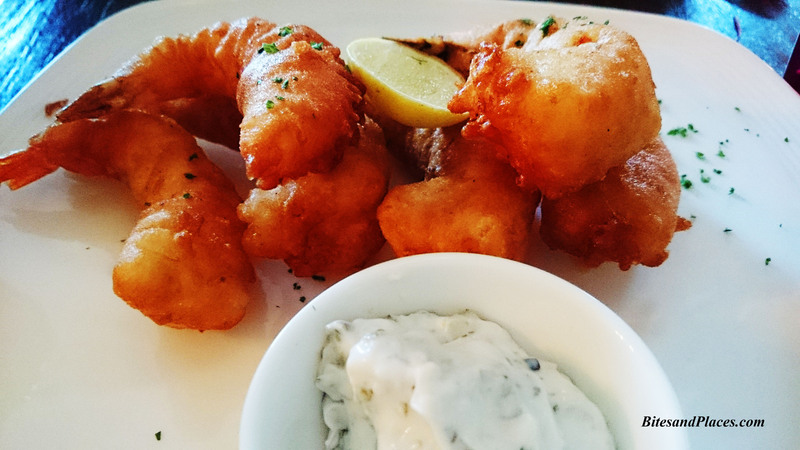 The Beer Batter Prawns in Tartare Sauce were cooked to perfection. 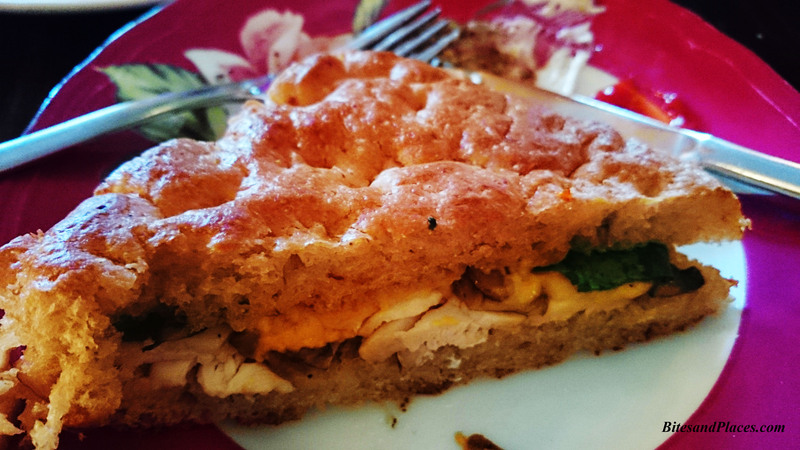 We loved the Smoked Chicken and Mushroom Sandwich with Garlic Aioli. 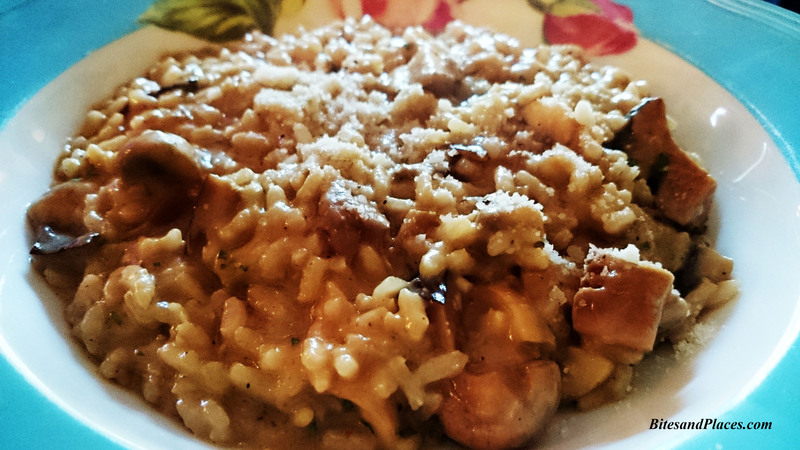 The Wild Dried Mushroom Risotto was just about okay. A sizable portion too. 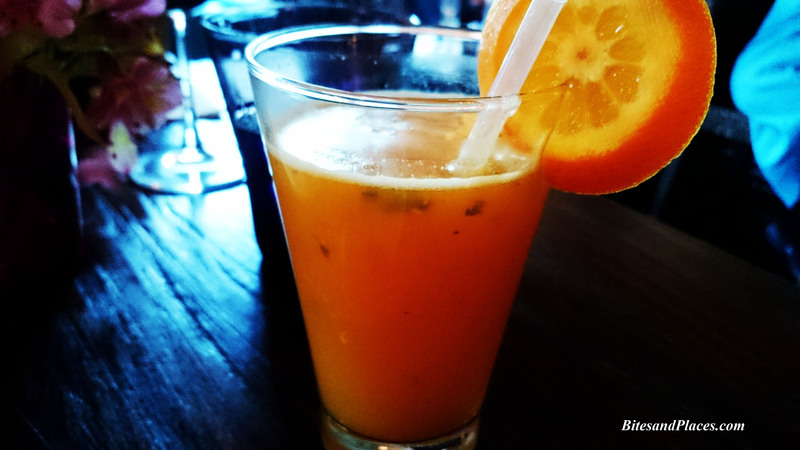 We washed these down with an Orange Blossom, a tangy cooler with mint and peach syrup and a glass of Edmara Pinot Noir. Service: Although you are attended to quickly, the order takes time from kitchen to the table. Considering the number of patrons they serve, its okay to ignore. If you are lost hovering, pondering and flipping over the menu, don’t hesitate to ask the waiter for suggestions. He’ll gladly oblige. My Say: Food is delectable. Full marks (plus few extra) for the inviting ambience. Service is great. Negatives could be the price. 2 to 3 grands easily for a meal of two. Its tad difficult to locate for a first-timer. They could place couple of signboards to make the place easy to locate. I used to be petrified with the slightest thought of baking in a pressure cooker. What if the cooker bursts!!! I’d witnessed this horrifying incident with my aunt when I was a little kid. The cooker went woossshh and off went the rice flying to the roof leaving her burnt and my mind, bruised for life. Until last week when I finally decided to kill this fear. I said to myself what if it doesn’t. What if I bake a real good cake. And so I did. 1. Use a cooker with a wider circumference and capacity of 3 – 5 litres, right enough to fit a 21 cm round bottom cake tin. Its advisable to use an aluminium cooker than a non-stick one. 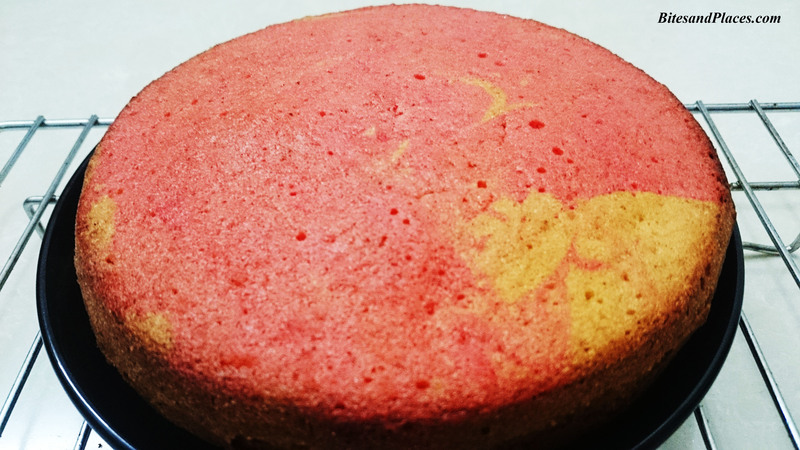 We want to bake the cake and not steam it. There has to be an oven-like environment, which is why no water. 6. The cooker has to be pre-heated, the way we pre-heat the oven. 7. Close the lid and place the cooker (without gasket, without whistle, without water) first on high heat for 3 minutes and then on low for 2 minutes. 1. Line the inner side of the tin with butter and baking parchment. 2. When the baking parchment is in place, rub butter all over it and dust with flour. 1. Sift the flour and baking powder. 3. Add eggs one by one, add essence and keep beating. 4. Fold in the flour and baking powder. 5. Add milk and beat till there are no lumps. 6. Divide the mixture in two halves. 7. Add colour in one of the halves and mix. 8. Spoon the mixture inside the prepared tin, alternating the vanilla and strawberry. 9. Take a toothpick and drawn a zig-zag pattern over the surface to create a marble effect. 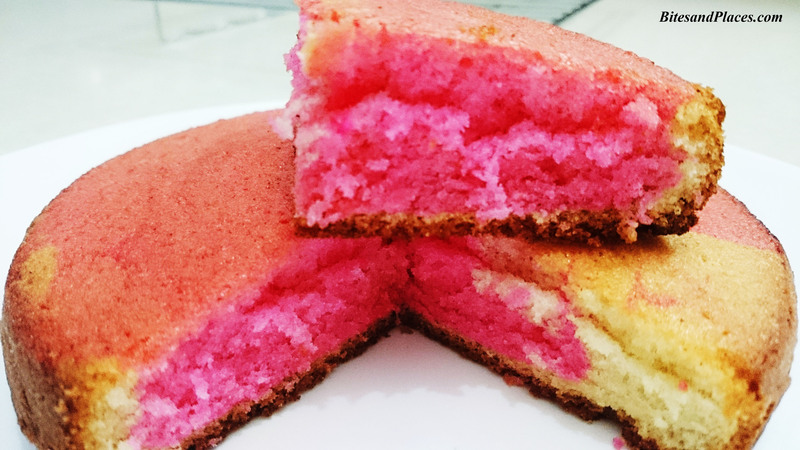 Alternatively, you can pour the strawberry mixture above the vanilla or vice-versa. 10. Pat the tin to remove any extra air bubbles. 11. Gently place the tin over the stand in the cooker and close the lid. Bake for 40 – 45 minutes. 12. Do the fork test, first at the sides, then at the centre. It should come out clean when done. 13. Transfer it to the wire rack to cool for 30 minutes. 1. ***** is really really important. 2. Its advisable to use a regular aluminium cooker than a non-stick one. 3. Baking more than once a month in a pressure cooker is not recommended. Regular use might lead to deterioration. 4. Works well with tutti-frutti cake and chocolate sponge. P.S. : Looks stunning, doesn’t it! On the other side of fear is victory. Well, in my case, it was this incredibly gorgeous, buttery-soft delight. 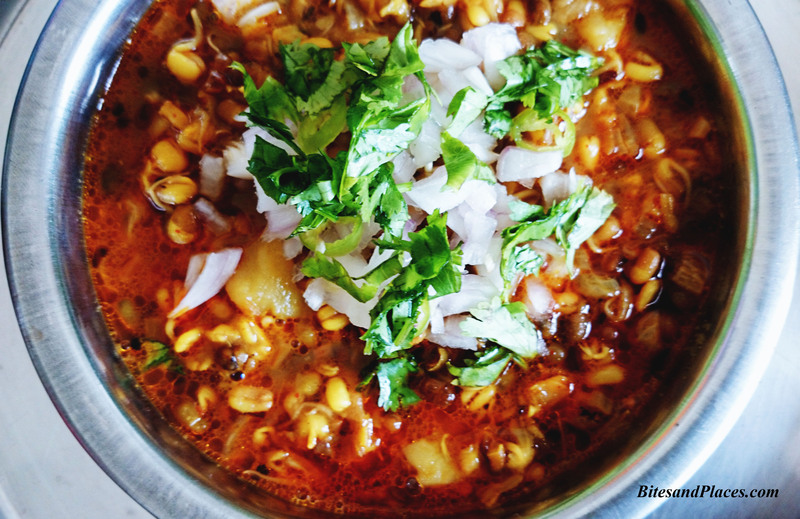 Sprouted moth beans curry or “Matki Chi Usal” in Marathi, is well-known in every nook and corner of Maharashtra – in homes and restaurants alike. Sprouts pack a protein punch. Rich in antioxidants and fiber, there’s whole lot of nutrition on the plate. You can sprout them at home or just grab the ready ones from the market. I do it at home. Love to see those long gorgeous sprouts developing right in front of me. 1. Pressure cook the matki and potato cubes with a cup of water and turmeric. (Remember not to overcook). 2. Heat oil in a wok. Add the mustard seeds and let them spatter. 3. Add cumin seeds and curry leaves and stir. 9. Mix well and let it simmer on medium for about 5 minutes. 10. Add more water if you don’t want it too dry. 10. Lastly add lemon juice and stir. 12. Serve hot with chapatis or any Indian bread. Goes well with steamed rice too. P.S. : After cooling completely, can be refrigerated in an air-tight container for 3 – 4 days.